Need a new nightstand for your bedroom? Why not DIY? Have some fun with an easy project and make a beautiful DIY nightstand using one of these great tutorials. 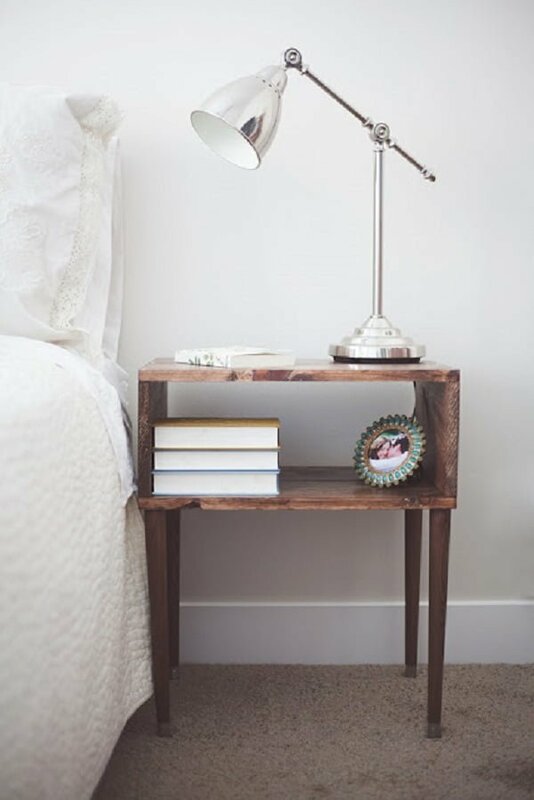 One of the easiest ways to do a mini makeover of a bedroom is to change or add a new nightstand. This small piece of furniture is as functional as it has high decor impact. In other words, having a bedside table is quite a necessity. As a small piece of furniture, a nightstand is easy to build, even if you’re not a seasoned handicrafter. There’s always more choice at your disposal when you decide to do it yourself, and you’ll still get a unique piece. 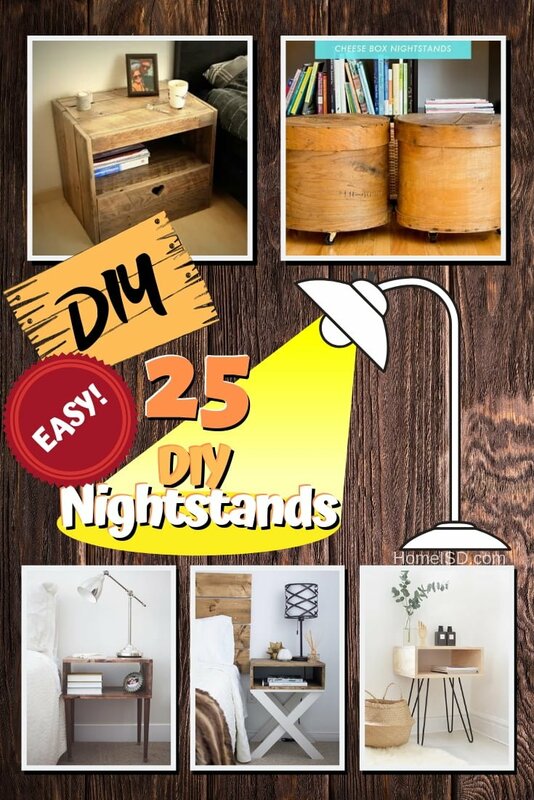 So here are 25 easy DIY tutorials for you to follow if you choose to revamp your bedroom with a new nightstand. 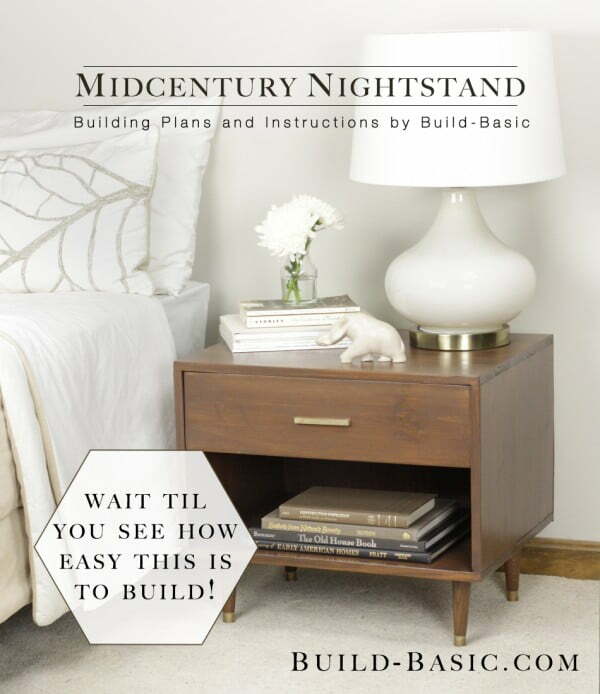 Build this Mid-century inspired rustic nightstand the easy way. If you’re looking for something cheap but also good looking, this is the right project. It takes just a few wood boards and legs – everything you can pick up in a hardware store very cheap. 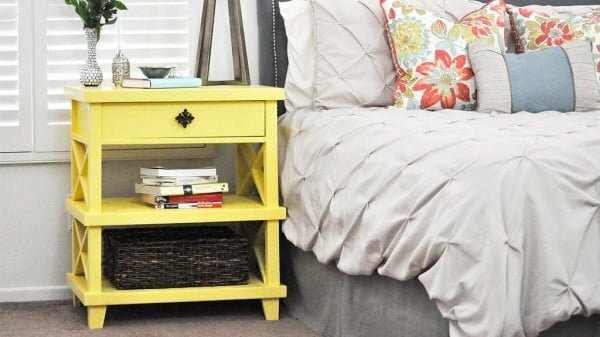 Enjoy making this nightstand on a budget. This one is very similar to the previous project and maybe even easier. 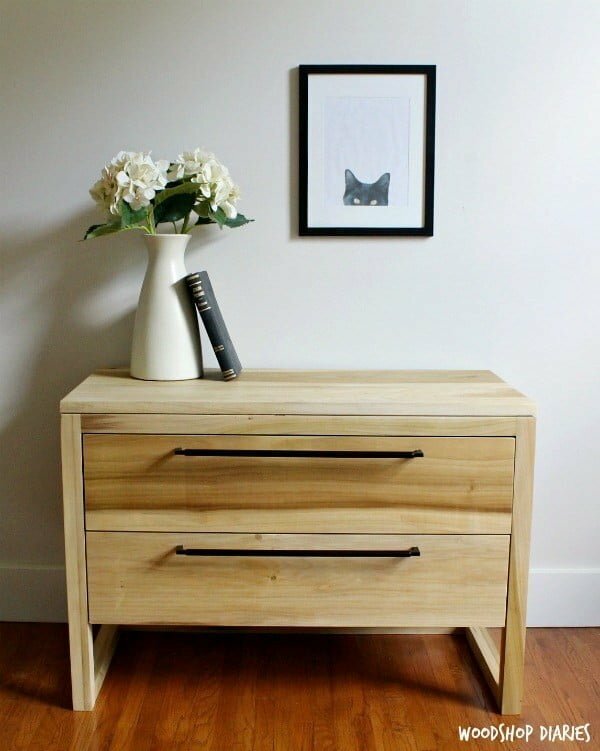 You will build a beautiful Mid-century inspired nightstand from simple plywood and hairpin legs. It’s also cheaper and easier to put together. And it does look good. 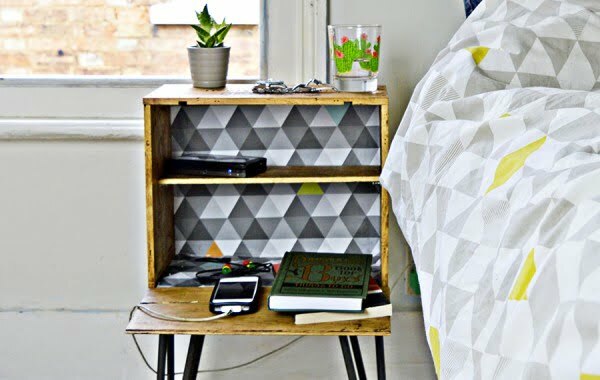 This clever X-base DIY nightstand will be a hit in your bedroom decor if you build it. The X-shaped legs do all the magic making the rustic top visually interesting. The nightstand occupies much less visual space this way and lets the rustic tabletop reveal itself — a fun little project. We love projects that turn out easier than they look. And this Mid-century style nightstand is precisely that. All you have to do is follow these simple plans to build it. The drawer is an optional but a welcome addition that you can make too. This project is more involved, and the outcome is naturally a lot more impressive. 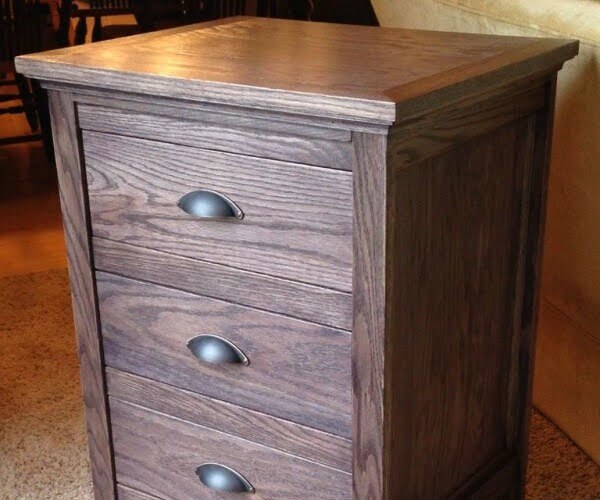 You can build a full nightstand dresser using these plans and instructions. And it includes a hidden little drawer for whatever you may need hiding. It’s a neat project if you like a little challenge. Sometimes you need something compact and quick to make. It’s especially true in tiny bedrooms where space is a luxury. So make this little floating shelves for a nightstand. It’s so easy yet so functional. Here’s another great project idea for small bedrooms. 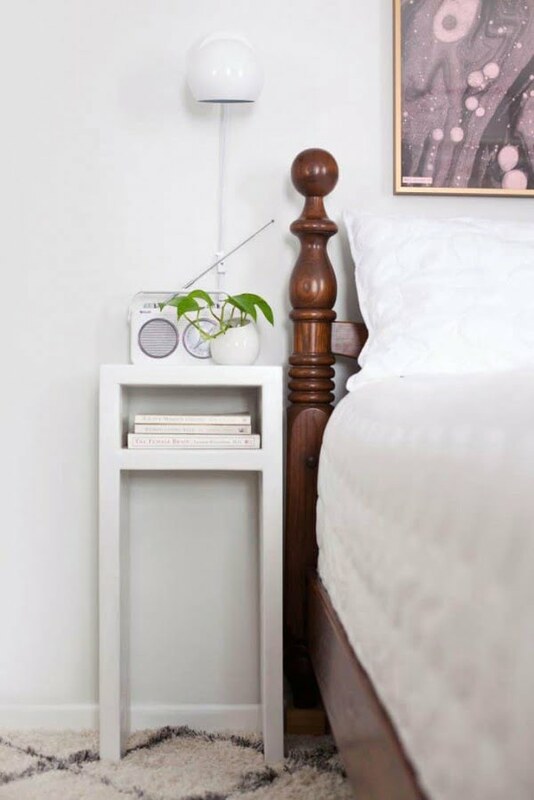 This DIY Parsons nightstand is very minimalist and takes little space. And yet it provides enough storage for the bedside. 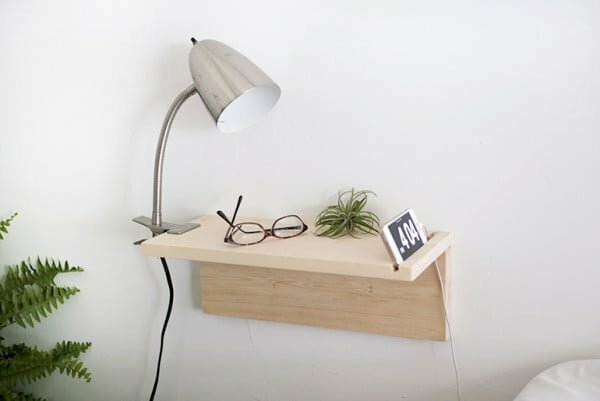 This nightstand shelf is as simple as they get. It’s a wooden board attached to a wall. But the real accent in this project is the beautiful copper pipe lighting fixture that adds so much charm to the bedroom decor. This classic style full bedside table is a real gem. And while to build one you will spend the whole day (possibly even more) you will enjoy it for ages. Nightstands like this cost a pretty penny and you’re going to make one yourself – that’s some sweet savings! We love repurposing projects because they make unique things from materials that are waste. 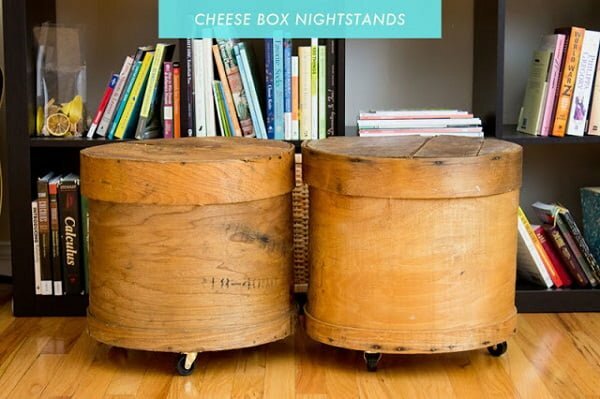 And now check out how old cheese boxes can turn into beautiful accent nightstands for the bedroom. Brilliant! This Pottery Barn inspired project is as complicated as it is brilliant. But if you want to build something like this, you have these free plans and instructions to follow. You can do it; we are sure about it! It’s easy to build something when you already have a pre-made shape of it. An old wine crate works as an excellent base for a nightstand. And what you get is a lovely rustic bedside table that is very easy to build. This is a full nightstand with two drawers that are big enough to satisfy all your bedroom storage needs. You can even store blankets in there. And it’s surprisingly a reasonably easy project to do. Check it out. There’s no easier DIY furniture project than building this floating nightstand. If you have an old cabinet door available for reuse, this project will be a breeze. 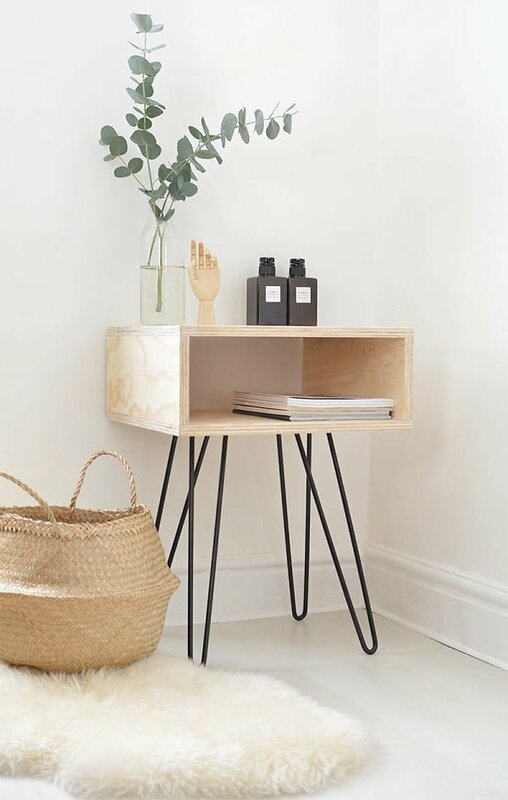 The nightstand made this way is perfect for small spaces and it has decor interest as well. If you were given a couple of milk crates, you probably wouldn’t think about building a piece of furniture from them. However, as surprising as it may be this DIY project is exactly about that. 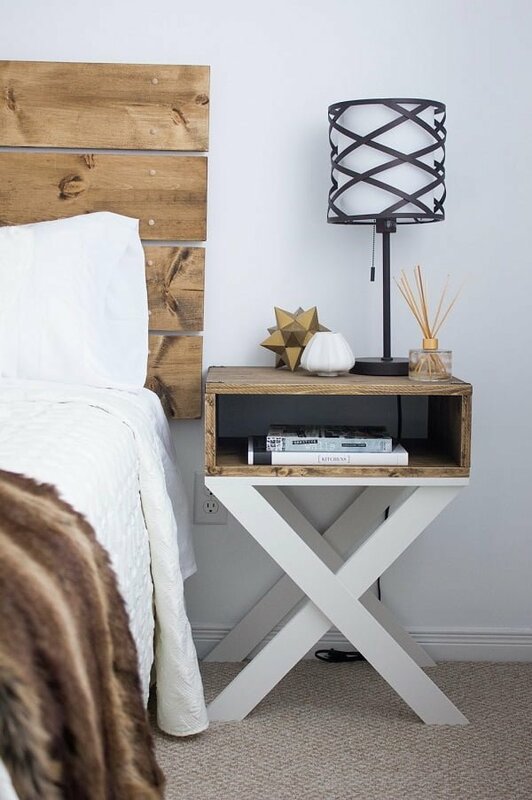 Make a rustic nightstand the easy way by following this tutorial. Using as little materials as possible and keeping it inexpensive is what we’re looking from in an easy DIY project. If you’re new to building your own furniture, you’ll like this tutorial too. Build your own floating nightstand form a single 1x8x8 wooden board. If you like functional furniture, then you will find this DIY project interesting. 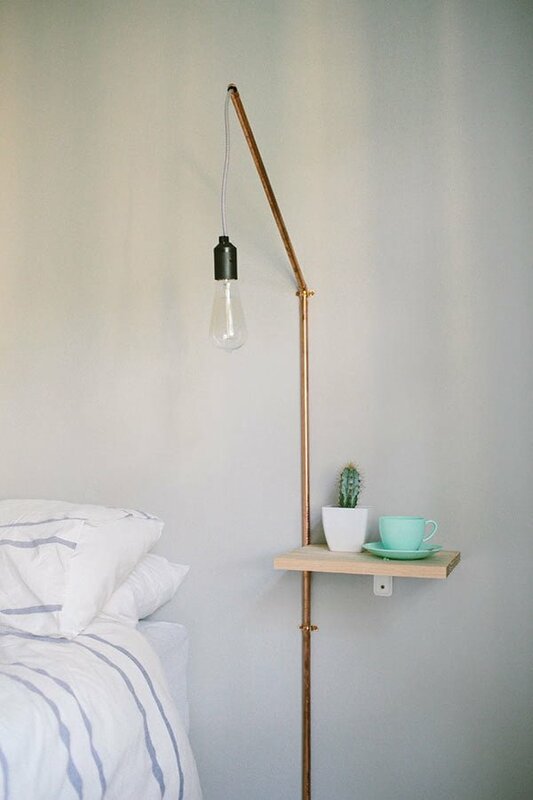 This wall mounted nightstand is simple to build but the added lighting fixture makes it very useful. Furniture with storage is especially useful in small bedrooms, even better if it improves decor. This beautiful nightstand design is both, functional and visually appealing. Most importantly you can build it yourself. If farmhouse style is appealing to you and you’d like to see the furniture of this style in your bedroom, then this DIY project is for you. It may be a little bit more complicated to do but you’ll love the nightstand with cabinet space. DIY pallet wood projects are some of the easiest. Building this little nightstand with a lot of rustic appeal is not that complicated at all while all you need is a pallet for material. 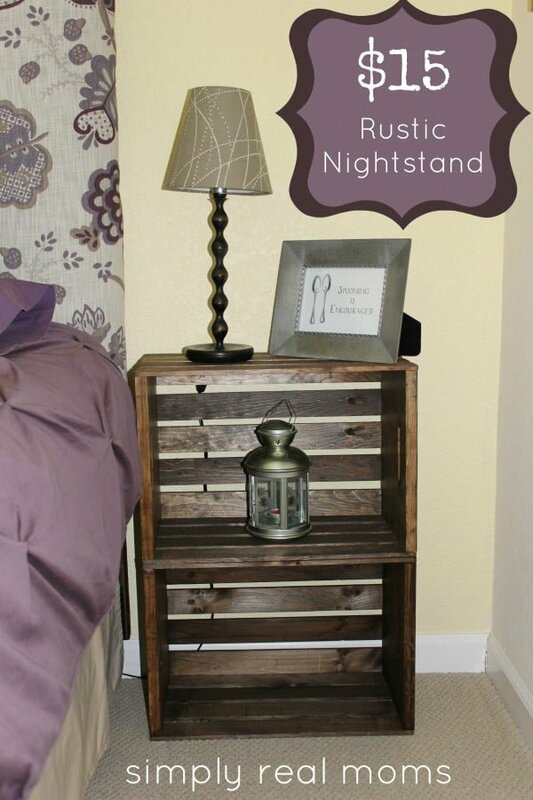 This DIY nightstand project is one of the most creative. It makes use of the convenient shape of wooden magazine holders which happen to be perfect for a tabletop. This DIY solution offers storage as well as visual appeal. Midcentury style certainly has a big fandom. If you’re one of them, you will like this DIY project for a nightstand. Enjoy making this spacious piece of furniture with thin legs made famous by this style. Looking for an interesting nightstand solution for a small bedroom? Save space by hanging it from the ceiling. 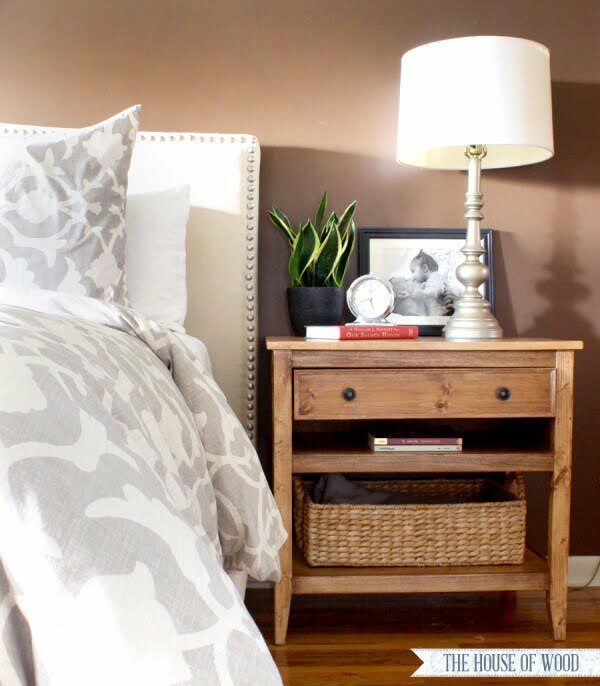 This DIY project will allow you to build this easy nightstand with a lot of decor interest. An old suitcase can become a whimsical piece of furniture if you put your mind to it. It’s a very easy DIY project too because a suitcase is already kind of like a tabletop. One more DIY project for you pallet wood craft fans out there. This small nightstand features open storage space and a drawer in a nice and warm rustic style.